Since its early establishment Alpha-66 has retained a militaristic philosophy and has professed the violent overthrow of Cuba's revolutionary government. Alpha 66 is a U.S.-based militant organization, formed by Cuban exiles in Puerto Rico in 1961, whose primary purpose was to overthrow the communist government of Cuba. Alpha-66 received considerable funding from right-wing figures such as Henry Luce and Claire Booth Luce.VideoVideo: Short clips from a documentary on Alpha-66Video: Interview with orginal memeber, Ernesto Díaz Rodríguez, Secretary General of Alpha-66. Alpha-66, also known as Cuban Counterrevolutionary, Alpha 66 is an active group formed c. 1961. 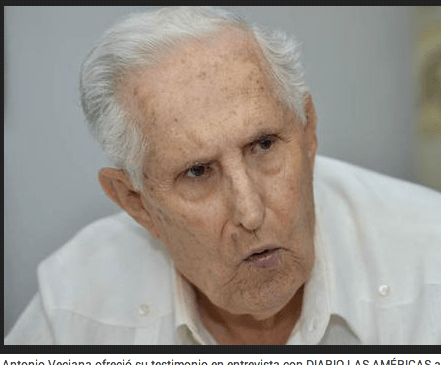 Veciana’s statements put him in agreement with one of his life-long enemies, Fabian Escalante, retired chief of counterintelligence for the Cuba’s CIA, known as the Diregencia General de Inteligencia, or DGI. Escalante has said the DGI concluded the CIA and Cuban exiles were behind JFK’s assassination. Here’s the original story: “A Kennedy lo mató la CIA”, asegura exagente de la CIA | Diario las Americas. Here’s a rough Google machine translation, not for quotation: ‘The CIA killed Kennedy,” says ex-CIA agent.